St. John’s Family, we are in for a musical treat! 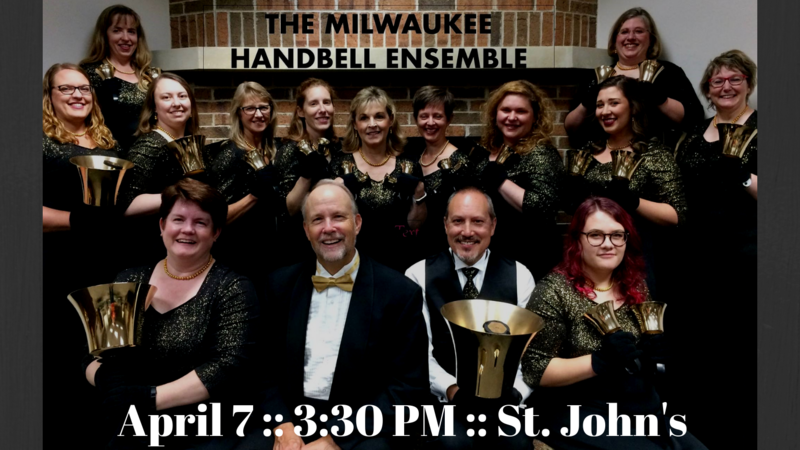 On Sunday, April 7th, St. John’s will be hosting the Milwaukee Handbell Ensemble (MHE) for a concert at 3:30pm in the sanctuary. The concert is free to all attendees. There will be a free-will offering collected to help St. John’s refurbish its handbell and handchime set (the same set used by MHE). This is an outstanding musical group, and you will not want to miss this opportunity. This will also be our only opportunity to host the group under the phenomenal direction of Dr. John Behnke, as he will be retiring at the end of this season. Over the past 16 years, MHE has gained wide popularity in the community and beyond. MHE is an auditioned community handbell ensemble under the direction of notable composer, performer, and clinician Dr. John Behnke, with sixteen ringers who play 73 handbells and 73 hand chimes, creating sounds that you would never expect from a bell choir! Within these 16 years, MHE has become known for amazing memorized performances, for premiering new arrangements of popular music, as well as being the recording choir for AGEHR Publishing. They have been guest performers with the Midwest Vocal Express, Bel Canto Chorus, Present Music, and the Milwaukee Symphony Orchestra and Chorus. In fact, MHE has performed five times with MSO under conductors Doc Severinsen, Stuart Chafetz, Jeff Tyzik, and Andreas Delfs. Over the past three years, MHE has expanded their reach by taking mini-tours to Minnesota, South Dakota and Michigan, performing by invitation at the Area 7 Handbell Festival in Sioux Falls in 2016 and most recently, in the summer of 2018, played the closing concert of the National Seminar for the Handbell Musicians of America in Grand Rapids, Michigan. In May of 2013, the Milwaukee Handbell Ensemble became a non-profit 501(c)(3) organization. Their mission is “To further the art of handbell ringing by educating, inspiring and informing others on the art form” by showcasing advanced handbell repertoire while being a musical resource for the Milwaukee metropolitan area and beyond. This concert is a must see for people of all ages. We promise that you will not want to miss this event! For more information about the concert or how you can get involved with the St. John’s handbell choir, please contact Rachel Morton at rmorton@stjohnswestbend.org.